New ways to enhance your embroidery experience and make it easier than ever to combine beautiful designs and fonts. • Personalize your designs directly on screen. • Create your own combination of designs and/or fonts and save them in the memory or on a USB-stick. • You can create and embroider large designs up to 14¼"x8" (360x200mm) without re-hooping. • Two embroidery hoops included; DESIGNER™ Royal Hoop for designs up to 14¼"x8" (360x200mm) and DESIGNER™ Splendid Square Hoop for designs up to 4¾"x4 ¾" (120x120mm). • Several optional hoops available for special techniques like endless embroideries, quilting, textured embroideries and much more. • HUSQVARNA VIKING® is constantly developing new hoops and accessories for various techniques. 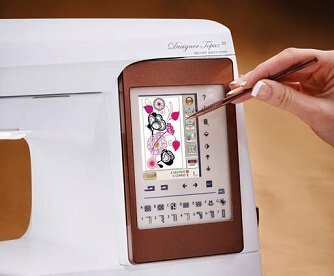 • Sew large quilts, home decor projects, and garments easily with the large sewing surface. • Large area to the right of the needle, nearly 10" (250 mm), for wonderful ease of sewing. • Endless opportunities to be creative. • All designs include Automatic Jump Stitch Trims. • 5 sewing fonts with both upper and lower case letters for easy programming. Sensor One-Step Buttonhole Foot, Self-Adhesive Glide Plates. Pieces of fabric and stabilizer, DESIGNER TOPAZ™ 50 Sampler book, Warranty card, Microfiber cloth.